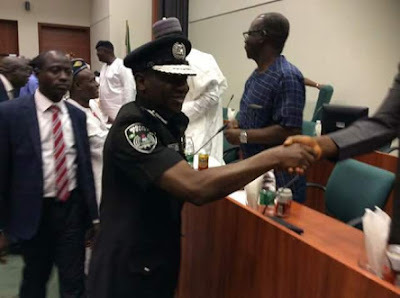 The Inspector-General of Police, Ibrahim Idris, has appeared before senators over the alleged maltreatment of Senator Dino Melaye during his arrest and detention by the police. IGP Idris was led into the chamber even though Senate’s plenary was closed at 11:07 am. The order paper released on Senate's twitter handle revealed that IGP Idris will also answer questions on what security operatives are doing over the killings taking place in the country by suspected herdsmen.